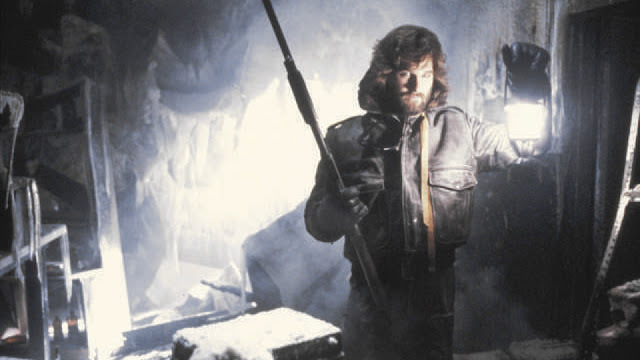 Released two years before I was born and considered by many to be one of the great masterpieces of horror cinema, I finally now witnessed John Carpenter's The Thing and sure enough, I found myself pulling the blankets up over my face but not for the reasons I expected. Sure, it was a pretty terrifying feature and worthy of a bit of fear induced cowering, but the fact that I paused the film at one point to go get an extra blanket was mostly because of, in my opinion, the single most brilliant aspect of the entire experience: the setting. An isolated, claustrophobic winter landscape on its own can be daunting and scary. I actually prefer the house to be cold at night while I am watching a movie, but honestly, I grew a bit uncomfortable and was searching for warmth as The Thing rolled along, which is a massive compliment to what the film was able to achieve. The beauty of a location like Antarctica is that it somehow simultaneously is both open and never-ending and yet closed off and small and hopeless. It's like you have everywhere and yet nowhere to go all at the same time. In this way, it is actually more suffocating than a very small room or a prison cell because with those locations, you know what to expect if you are able to reach the outside. On the other side of those walls lies freedom. Even if you are surrounded by death, even if you can't trust the man next to you...the deadly cold presents no other options. You can't stay, but you can't leave either. Hopeless. Suspenseful, haunting, agonizing, grotesque. John Carpenter crafted my absolute favorite horror film of all time, Halloween, and with a few more viewings of The Thing he may have placed another work on the same, elevated pedestal. The score by Ennio Morricone, the photography of the barren landscapes, everything. I feel as if I need to watch this again soon in order to truly appreciate it with the depth it deserves. I'm sitting here in shorts and a t-shirt in the warm comfort of my home, but just writing about this film makes me feel cold all over again. How often does a film literally make you uncomfortable enough that you are forced to change your clothes?